Departing from Archerfield Airport, I was reluctant to fill the ferry tanks for my flight to Darwin. Archerfield's longest runway is a little under 5,000 ft long, and from experience I now knew that I'd need at least 7,000 ft to get safely launched when at full ferry weight. I could either fly back over to Brisbane International for fuel (where the runway is much longer) and proceed nonstop to Darwin, or I could just pick a halfway point as a refueling stop on my way northwest. I decided on the latter. I flew inland from Brisbane for just under six hours to reach Mount Isa, a mining town on the border between Queensland and the Northern Territories. That six hours gave me a good feeling for Australia's famous topography. Starting at the eastern shoreline was a fertile band of land much resembling that on our own eastern seaboard (except, of course, that Australia doesn't have the population density of the US, so there were far fewer buildings and tracts of cleared land). Next came a couple of ranges of geologically old mountain ridges reaching altitudes of about 2,000 - 3,000 ft. These were thickly tree covered, and save the occasional dirt road, were mostly uninhabited. As I flew further inland the terrain became a little less forested, and started to look like the "bush" that we've all heard so much about. Every once in a while there would appear a winding gravel road, and other than a few rectangular water reservoirs, there was even less evidence of human presence. Finally, about 300 miles inland everything went from green to a brownish red, marking the beginning of the iron saturated soil that predominates in Australia's center. This area also boasted some pretty impressive rock formations, cliffs, and gullies. I tried to capture these in pictures, but the lack of a telephoto lens made this effort less than successful. Refueling at Mt. Isa was quick, and I was airborne again in about 30 minutes after landing. The rest of the trip to Darwin was flown mostly after dark, since the sun set at about 6:30 pm. 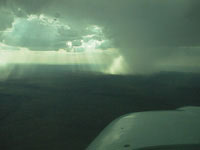 I therefore didn't get to see much more terrain, although I did catch the one photo shown below of a rain cloud, a few shafts of sunlight, and a smoking bushfire, all in one shot, shortly after takeoff. After sunset, I actually flew for a full two hours without seeing a single light from the ground. That was a 24 year first for me. Even in the western USA, you can see the lights of the ranches and small towns at least every couple of dozen miles. Over the Atlantic Ocean you can see ships every once in a while. Despite excellent visibility in excess of 30 miles, I saw nothing! Boy, Australia really doesn't have much of a population crowding problem! Finally the lights of the northern coastal area appeared about 4 hours into the flight, and I landed at Darwin after a smooth trip lasting about 5 hours and 30 minutes. Rain shafts, plus streaks of setting sunlight, plus the flames and smoke of a bushfire in the Queensland outback. 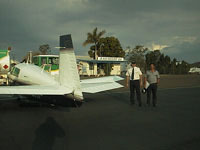 Local pilot Josh and fuel service agent Ron greeting the "Yankee airplane" at Mount Isa Airport, Queensland, Australia. A massive ridgeline in the Australian outback viewed from 10,000 ft. Many "Aussies" live on ranches, called "stations" in the outback. Kids attend school by radio and mail, and medical care is provided by a unique group of health care providers who travel around the outback via small aircraft. 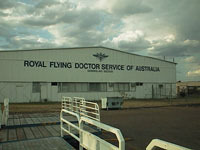 This was one of the hangars of the Queensland branch of the Royal Flying Doctor Service. I saw this one at Mt. Isa. Housecalls still exist! On Sept. 23rd I spent the day "in the wild" in one of the world's most impressive nature preserves, the Kakadu National Park, situated on 20,000 square kilometers of aboriginal tribal lands in the Northern Territory. I went with a fun bunch of folks hailing from all corners of the earth. Under the guidance of an experienced outback guide (who for all the world reminded me of Paul Hogan, a.k.a, Crocodile Dundee! ), we drove through hundreds of kilometers of back bush country, took a heart stopping cruise down a muddy river crawling with huge saltwater crocodiles, and visited a site displaying aboriginal stone paintings dating back more than a thousand years. 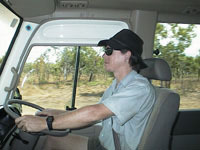 Our outback tour guide, who I swear reminded me of Crocodile Dundee. His real name was Lee, and apparently he'd heard that "compliment" many times before! 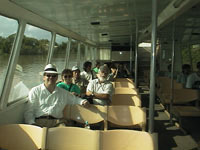 Here I'm on the river cruise with some of my new touring friends. The pair sitting behind me was an American couple from Seattle, the only Americans I had seen anywhere since leaving Hawaii two weeks earlier. 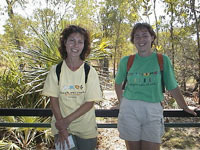 These two Dutch sisters, Marijke and Martine, had left behind their husbands (and in Marijke's case, her three kids) to set out together on a 30 day backpacking tour of Australia's outback. America has no corner on the market for independent-thinking women, they told me! 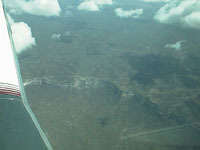 A wetlands area that developed following the construction of a man-made levee to hold back some of the water during northern Australia's half-year dry season. The flora and fauna here are very dense. 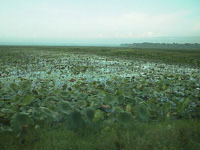 In addition to the flowering water lilies shown, a recent census counted an average of seven snakes per square meter inhabiting this land. The majority of those are poisonous, and a large number are big (10 - 15 ft long) pythons. Australia protects those creatures, with road signs cautioning drivers to avoid snakes in the road. Since the snakes only come out at night, my new friends and I were not terribly disappointed when we failed to see any on our daylight outback jaunt! 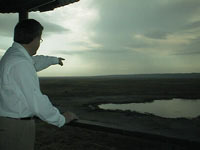 Here I'm pointing out a family of six wild wallabies roaming near a pond about 100 ft from the elevated observation stand. The animals don't show up well in this digital picture, so you'll just have to take my word for them being there! 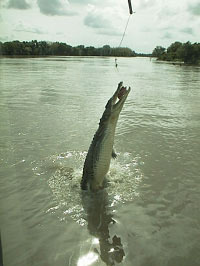 To show off the aggressiveness of the Kakadu's saltwater crocodiles, the tour boat guides dangle slabs of meat from fishing lines and wait for the action, which doesn't take long on these rivers. Here a massive 12 - 15 ft long reptile closes for the "kill." The smaller, younger ones are more agile, and the guides are able to get them to jump quite a way out of the water by dangling the meat well over their heads. This one was really hungry. Tourists were admonished to keep in mind the power and speed of these creatures. 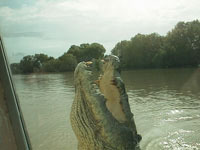 Saltwater croc's in northern Australia attack five or six visitors every year, mostly folks who take unauthorized hikes near the shoreline for a closer look. These attacks can be, and too often are, fatal. One gigantic pile of termite dung! 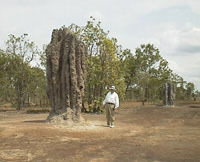 I'm standing next to a large, but not Australia's largest, cathedral termite mound. These take years for the insects to build, which they construct using their own excrement. Like an iceberg, what you see is only a small portion of this active colony's home. Tunnels reach hundreds of feet into the ground, sometimes deep enough to access underground water supplies to support the colony during the dry season. The purpose of the mound is to provide a constant inside temperature of about 90 degrees Fahrenheit year around, important to the bugs' metabolism. Tiny pores in the mound are opened or closed as required to maintain either ventilation or insulation. 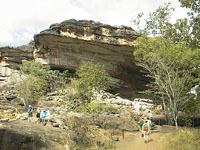 A large, geologically ancient (supposedly 2.5 billion years old) sandstone outcropping upon which aboriginal peoples have painted designs over the centuries. 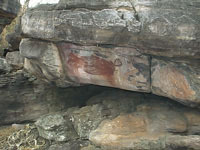 Aborigines had no written language, so rock paintings were used to communicate, educate, and warn, as much as to entertain. Some drawings depict which local fish make the best catches in a given season, how to clean and prepare them, and what fate will befall any poor sap who elects to catch the fish too early in the season (Aborigines punished tribesmen for this, as they feared harvesting fish before the fish could lay their eggs would reduce the following year's population of fish). 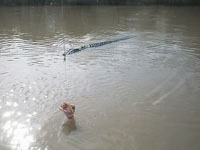 Others warn not to approach crocodiles! Still other, much more contemporary drawings depict white settlers standing listlessly with hands in their pockets as they oversee their aboriginal workers.